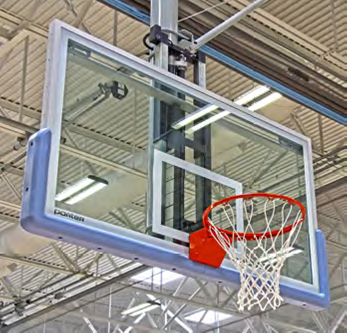 When choosing a basketball goal system, several factors must be considered such as where the system will be installed, how frequently the system will be used, and how heavy the usage will be once the system is installed. Forward Fold and Side Fold Ball Goal Systems are the mainstay for any college or high school basketball courts. Newly redesigned Indoor Portable Basketball Systems have been manufactured to satisfy the highest levels of competition and performance. Wall Mounted Systems allow you to attach your basketball goal to a wall in an auxillary gym, church, recreation center, and even to the side of your house or garage. Outdoor Portable Systems can be set up easily and conveniently and then rolled into a garage or folded down for storage. Portable systems do not offer the same stability as in-ground systems, but are a good choice for the casual or recreational player.